Season the chicken with salt and cayenne pepper. 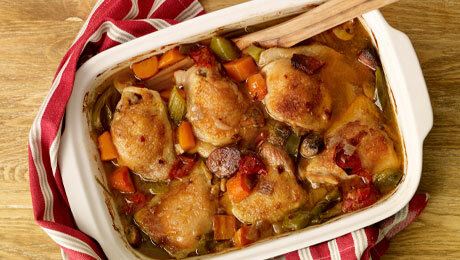 Pan fry the chicken on both sides until golden brown and transfer to a casserole dish. Dice all the vegetables in uniform patterns and add these to the frying pan with the crushed garlic and chorizo and sauté gently for 3-4 minutes. Add the tomatoes and the chicken stock at this stage and bring the entire mixture to the boil. Correct the seasoning, adding in the chilli flakes at this time if you wish to use them. Pour the mixture over the chicken in the casserole dish and transfer to the oven (180C/350F/Gas Mark 4) for 1 hour 15 minutes or until the chicken is coming away easily from the bone or when the juices run clear when a skewer is inserted into the chicken. Tried this last night. Really enjoyed it but would have liked the sauce to be thicker. I think the next time I make it I would add a little bit of cornflour just before serving to thicken it.